It’s starts, as always, with that voice. Two parts Alabama sunshine; one part Memphis rainstorm, it’s one of the most gorgeous sounding instruments in all of popular music. 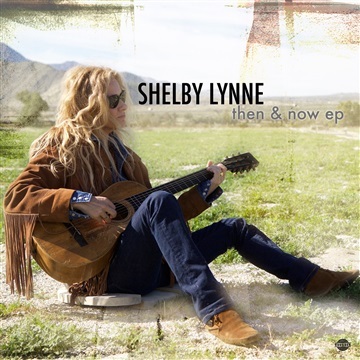 So begins Shelby Lynne’s 13th full-length album I Can’t Imagine, quite possibly the most brilliantly crafted and intensely affecting set of compositions since her landmark collection I Am Shelby Lynne in 2000. Comprising 10 new songs written or co-written by the GRAMMY winning vocalist, I Can’t Imagine is powered by Lynne’s lustrous, virtuosic vocal performance, her indelible, sparkling songwriting, and the sympathetic, versatile playing of a top-flight band, led by Los Angeles based guitarist Ben Peeler. The songs themselves reflect a panoply of Lynne’s influences – from Southern soul, Crescent City R&B, and California country & western to the ardent social consciousness of precursors like Woody Guthrie and even the roots ‘n blues vocalizing of Billie Holiday – all brought into clear focus by Lynne’s keen pop sensibility. “Better” and “I Can’t Imagine” with Philadelphia guitarist/keyboardist Pete Donnelly and “Sold the Devil (Sunshine)” with Peeler. As is apparent throughout her best work, Lynne dissects some dense emotional landscape on I Can’t Imagine. The truth in these characters manifests in their struggle for wisdom and transcendence. The girl in “Back Door Front Porch” pushes against the intense pull of home and all of it’s memories, its a “goodbye to my past” Lynne says. The migrant worker in “Son of a Gun,” a poignant, finely detailed Depression-era portrait, delivers the searing lyric: “Hunkered down low/Under a bridge/The voice in my belly/ Is my only friend.” “That’s a passion of mine, the Great Depression,” she says of the song. “It’s a tribute to that generation -- they’re my grandparents, but it could be today. I drew that parallel when I was writing it.” Lynne captures the ephemeral nature of innocence in “Following You,” adding, “that one is about my daddy – shooting squirrels in the woods with him when I was 11.” Reflecting on “Down Here,” a razor-edged southern rocker Lynne said, “When I read stories about people in the South throwing out their kids for being gay, I say, ‘What the ?’” The broken woman at the heart of “Better,” an exquisite, spaced-out L.A. country ballad, chants “It’s better that you’re gone” like a mantra. “She’s never gonna be right,” Lynne acknowledges. To record I Can’t Imagine, the Virginia-born, Alabama-bred Lynne – who has lived in Southern California for the last 16 years – returned to the South, to the intimate Dockside Studio in Maurice, Louisiana (population: 642). “It’s right on the Vermilion Bayou,” Lynne says. I Can’t Imagine anything better.